It’s no secret that hip-hop group Kottonmouth Kings have had lots of drama within the past year concerning the group and Subnoize Records. And it’s also no secret that Johnny Richter left KMK last year due to all of the drama, just being tired of it all and wanting to get back to the basics of creating music and playing shows. Johnny Richter officially went solo and resigned with Subnoize Records and what better way to show fans what he has to offer as a solo artist, than with his FreeKING Out EP. Opening track “FreeKing Out” has an old school hip hop beat that matches Richter’s rhyme flow perfectly, a good track to open the EP, letting his fans know what the album is all about. With “Richter’s Back” Richter lets us know that he has found his passion, which is making music. This track has a complex beat that accentuates Richter’s ability as a solo MC. “Let Me Win” changes things up a bit on the EP with the added vocals of Mina Fedora. Richter’s verse flow along with Mina’s singing chorus go really well together and is one of the better tracks on the album and one that will surely get stuck in your head as soon as you listen to the song. “Won’t Break” is an interesting track, with a Southern trap beat, but Richter makes it work. The verses and chorus really stand out on this track. “Talk About It” featuring Mina Fedora is an awesome track to close out the FreeKing Out EP. Richter tells his side of the story concerning what happened between him and the Kottonmouth Kings and why he left the group. 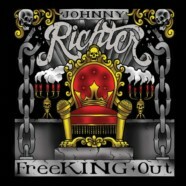 Many fans believe that Johnny Richter was the standout MC in KMK and FreeKing Out is a great EP that showcases his ability as an artist and lets fans know Richter has what it takes to be successful as a solo artist.